This past week, three teenagers from a small town in rural Pennsylvania were ordered to stand trial in the beating death of another resident of their town, a 25 year old Mexican immigrant named Luis Ramirez. The accused are all members of the local high school football team and are charged with amongst other things, aggravated assault and ethnic intimidation. The victim, who was with his fiancée at the time of the attack, leaves behind two small children. The very nature of the crime is bad enough, but what has sparked increased attention is the fact that the white youth are from an area recently experiencing an increase in its Hispanic population, and Ramirez was an illegal immigrant. Suddenly, this case has moved beyond the issue of a man being beaten to death into a larger commentary on the extremely charged and emotional debate over the issue of immigration. Already during the preliminary hearings, protests erupted both in support of both the victim and his family and in support of the defendants. One AP photo from that day was particularly striking. 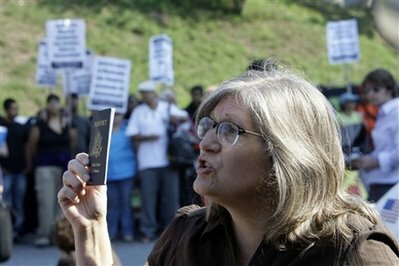 In it, a local woman is clutching an American passport as she spoke to reporters in support of the youths who allegedly sucker punched Ramirez and then repeatedly kicked him in the head while yelling anti-Mexican epithets. Presumably, she held the passport to draw attention to Ramirez’s immigration status. It is true that he did not possess such documentation. As a “Have”, this woman wanted to make clear that Luis Ramirez was a “Have Not”. On the other side of the country there was a much happier story about a woman who is a Have Not. Nelly Rico of Los Angeles does not have a US passport. Like Luis Ramirez, she entered this country illegally. Also like him, she went to work at menial jobs to build a better life for her American born children – six of them – whom she raised as a single parent. 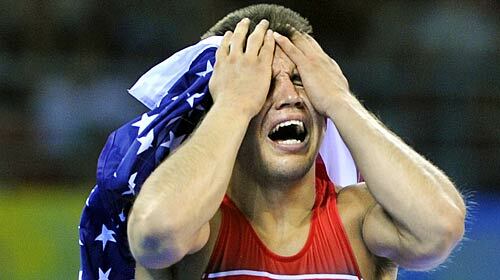 Unfortunately for Nelly, lacking a passport meant that she was unable to travel to the Olympic Games in Beijing to be present this past week when her son, Henry Cejudo, won a gold medal in free style wrestling for the United States. Nelly missed being there in person as Henry, upon winning, tearfully embraced the red white and blue and declared himself to be the realization of the American Dream. Henry’s poor kid makes good story is the kind that we as a nation like to pride ourselves on. The problem is when a few take it upon themselves to decide who gets a shot at that dream. Taken to an extreme, others may even believe that being a “Have” allows them to justify unjustifiable acts against the Have-Nots. But Nelly Rico does not feel like a Have Not. According to Henry, she considers herself an American. So, shouldn’t we do so as well? No legislative action will ever undo deep seated feelings of hate and prejudice. However, stories like Henry, and others that come out of these Olympic Games can help us focus on the good and share in Nelly Rico’s pride of being an American. Maria Meier is a principal at the Dewey Square Group’ Latinovations division and has fifteen years of legislative, political and communications experience at the national and local level. Prior to joining DSG Meier was the executive director of the Congressional Hispanic Caucus, where she developed and implemented the national strategy for the 21-member organization. During the 2004 presidential campaign, she helped develop Hispanic messaging and policy stances for the Kerry/Edwards Campaign.